← What Did The Pope Really Say? I was on an airplane for most of this… but I understand that the silver trumpets, retired from use by Paul VI, were used in the Vatican Basilica for the consistory. This entry was posted in Just Too Cool and tagged silver trumpets. Bookmark the permalink. They were. The brass ensemble with silver trumpeters and others executed the same processional music that in pre-Pauline times used to accompany the entrance of the Pope in St. Peter’s. And they were there not only for the Consistory, but also for the Mass of Rings. Perhaps they will be restored on a permanent basis. Perhaps this restoration has to do with the new Director of the Sistine Choir. The Consistory was his first liturgy since assuming his office. By the way, if you have access to video of the consistory (go, for instance, to KTOTV), you will see that the Sistine Choir and its Director, while still singing Palestrina’s “Tu es Petrus” genuflected for the passage of the Roman Pontiff (at the ktotv video this happens arround 8:24). This is also a restoration of gestures past. In the pre-Novus Ordo days, whenever the Pope was in procession (either entering or leaving St Peter’s in the Sedia Gestatoria, or walking between the Altar of the Confession and the Throne during a Papal Mass), the people on the flanks of the Pope’s procession would genuflect when he passed. Of course, Popes, as other bishops, when in procession, make the sign of the cross to the sides, in a gesture of blessing. In the old days, people would kneel when those blessings were made. That people now stand during the entrance and recessional of the Pope is a modern Novus Ordo thing. So, it was good that the Sistine Choir genuflected. I’m just so happy to hear about traditions being restored! I’ve never been a big fan of any instrument other than the organ at liturgical services. While the silver trumpets were very beautiful and certainly fitting for the occasion, I’m always wary of the message it sends to the Universal Church about the use of other instruments such as the piano, violins, and, God forbid, the guitar. TNCath:Yah… those silver trumpets for the entrance of the Supreme Pontiff in the Vatican Basilica! 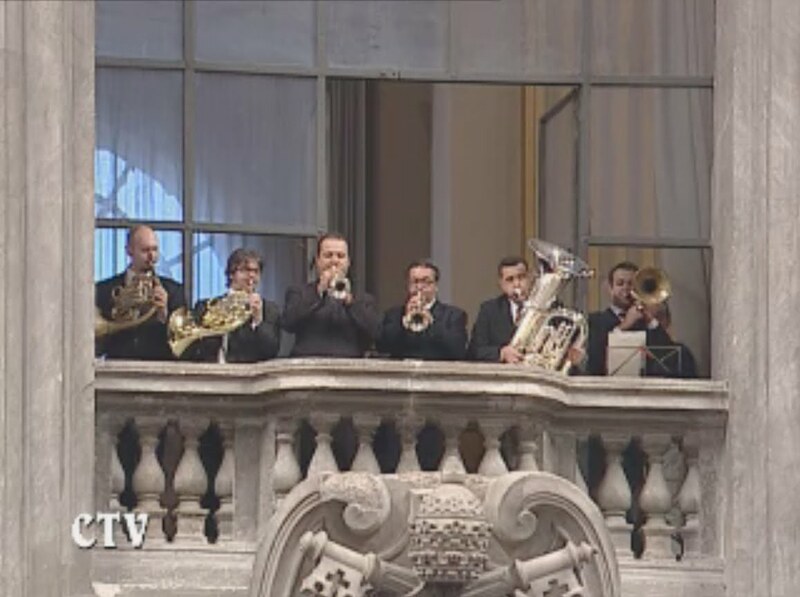 When I watched ‘some’ of the Consistory Mass via EWTN (the feed was not good in the bookstore where I used my laptop), I SAW the trumpets in the loggia inside St. Peter’s, but I couldn’t HEAR them….the commentators for Vatican Radio would not shut up! I ended up not being able to watch the whole thing because the audio and video kept stopping and starting….technology…argh….! irishgirl: the commentators for Vatican Radio would not shut up! There’s a screen shot from CTV on NLM. irishgirl the commentators for Vatican Radio would not shut up! This was at the consistory on Saturday. I thought of an e-mail complaining to Vatican Radio, but decided not to waste the time. However, between this broadcast and the Mass on Sunday, someone more influential than me evidently got the word to them. New announcer Sunday, the least obtrusive I’ve ever heard on a Vatican Radio feed. Not a single word intruded on the papal fanfare! Heard every note of it. Nor any “interference” with any of the other wonderful sacred music. I thought this consistory and Mass provided some kind of milestone in the Benedictine reform. As I watched and listened to the Mass yesterday, it occurred to me that, just a half dozen years ago, we could not have imagined what a difference could be accomplished by a mere change of pope, papal MC, and Sistine choir director. I’m sure you meant that in a sarcastic way, right? I would have loved to have heard the trumpets at the entrance procession-but it was very frustrating (on top of the ‘tech’ issues with the audio-video feed) not to hear them! Vatican Radio has got to get some better commentators! Fr. Z wrote: “Yah… those silver trumpets for the entrance of the Supreme Pontiff in the Vatican Basilica! I understand and agree with what you are saying. Certainly silver trumpets for the entrance of the Holy Father is certainly appropriate. However, what has taken place the last 40 years with the use of instruments other than the organ in liturgical ceremonies throughout the world has been less than appropriate, and that is not a slippery slope. It has been an avalanche from which we are still recovering. A revisiting of Tre le Sollecitudini, perhaps even an updating of it for Novus Ordo liturgies, might be helpful in outlining what is and what is not appropriate when it comes to the use of instruments at Mass. Lacrossecath, don’t blame EWTN. They were just picking up the Vatican Radio feed. They were Vatican Radio commentators who don’t know when to shut up (or maybe the same feed was used for radio). They blathered on during the presentation of the rings on Sunday and did not even identify who the Cardinals were. You still can! Go to the KTOTV website (in French). I have tried to post the direct link, but, whenever I do the post is immediately erased from the blog, automatically, 1 second after being posted. KTOTV is an internet tv; if you know French, click in videos, then ceremonies in Rome, and you will find the consistory video. What really makes me crazy is when they inform us that the pope has made some changes to allow for silence after the homily and Communion to give us time to meditate…then they talk through the silence! To be fair, they do Vatican Radio as well as TV, and the one sin of radio is to have “dead air”. (Because then people think the radio is malfunctioning, or they can miss the station as they try to tune in.) But in the old days, radio commentators used to have a kind of hushed solemn voice to cover moments of silence, with minimal commentary. (Not actually quieter, but allowing people to feel like it was quiet.) They could also do things like always be quiet when the music is on, or translate stuff in such a way as to allow listeners a feel for the original. I realize that this is difficult, and that many of the commentators only do radio and TV part time. But they’ve got a program book to work from, so I’m sure they could plan out some strategy ahead of time. Certainly understand your concern about the musical camel’s nose under the tent . . . But in the case of brass I think we’re o.k. – although that may just be a lawyer’s penchant for making fine distinctions. For one thing, organs have ‘trumpet’ stops that sound almost exactly like the real thing. For Christ the King we sang Telemann’s “Laudate Jehovam” and our music director decided he was going to lay on the trumpet rank and dial it up. It sounded like we had a gang of brass players concealed somewhere in the choir loft. And everybody downstairs loved it. An American Mother: Agreed! I used the trumpet stops yesterday for the Mass for Christ the King! For one thing, organs have ‘trumpet’ stops that sound almost exactly like the real thing. As a trumpet player, trumpet stops on an organ are a poor substitute for the real thing. Nowhere near the power or brilliance. The idea that silver trumpets are inappropriate for church… it makes my head hurt. Horn and brass instruments, and specifically the trumpet, have ancient associations with glory and majesty. Again and again, the angels are portrayed as playing them. They are associated also with heralds and news (hence specifically, the angels playing them in scenes of the announcement to the shepherds). In Christian liturgy, they stand in for the shofar, and all the trumpet references in the NT. The organ is the music of the whole cosmos, the voice is the music of humanity and the Word, but the trumpet is the music of God sending out His angels, and of the Trump of Doom. I knew you’d be after me for that comment if you saw it. You know what I meant . . . I hope. OF COURSE it’s not as good as the real thing, but we can’t borrow one of the trumpeters from the Atlanta Symphony very often. (We did have him in two Christmases ago for the Midnight Mass — several showcase pieces (including of course the inevitable Jeremiah Clarke) in what we call the “pre-game show” – the half hour while all the folks who never show up except for Christmas and Easter are trying to find a seat.) Nothing is more fun than listening to a really good trumpeter and organist enjoying themselves improvising bridges between the various works they’re supposed to be playing, tossing the conversational ball back and forth, so to speak. Of course you’re right — and of course the Archangel Gabriel is the best example. This little news made me quite happy today. I loved the Silveri Symphony played a few months ago that the poster linked. I cried a bit that day as it reminds me of how solemn and beautiful it was when played during the Elevation during one of Pope John XXIII’s Masses. I know it was once played all the time and at Pope Paul VI’s orders they fell silent. It would be so nice to hear them once again during the Elevation at Papal Masses once in a while. Like Christmas for example. It adds a solemn tone and just notes something unique, heard only during Papal Mass, not a regular Parish setting. It reminds us of the role of the Pope and the beauty of a Papal Mass. This could be incorported into the NO Mass. Silver trumpets. What a small, but significant moment for me. Prof. Basto: I went on the KTO site (via New Liturgical Movement) and I could not see or hear the video. Maybe my laptop needs another upgrade….sigh again…. With the Papal Visit Bellahouston Mass playing in the background (because my kids like watching it) with the full winds band, organ and choir, I wonder if you all can please explain what instruments are unable to be played in a liturgical manner? And which ones are specifically banned, please? As a convert this is new to me. Tu es Petrus, with the choir kneeling when the Pope passes is also available. Thanks for the video link, MarcusM! I got to hear the trumpets without the yakking! The fanfare sounded like something by Gabrielli. And I did see the choir kneeling as they sang ‘Tu es Petrus’–very cool! I love Palestrina!